Flying never gets old, whether you’re a 100-hour baby bird or a 10,000-hour airline eagle. Here’s one good reason. Telluride nestles in a pristine mountain valley elevated nearly two miles closer to the sky in southwestern Colorado. The surrounding peaks rear up another 3,500 feet above the valley floor on three sides, steep, forested inclines, challenging and unforgiving to the unknowing. It’s one of the most spectacular alpine venues in the Rockies, ideal for skiing (experts only), breathing, shooting commercials, TV and motion pictures, mountain photography, counting elk and just plain, uncomplicated living. At 9,000 feet up, only the athletic need apply. My first visit to this tall paradise was over Christmas break in the mid-’60s when I was 50 years more athletic, but that trip was in a ’63 Austin-Healey 3000, not a bad ride, but temporarily attached to Highway 145. At the time, I barely noticed the difference, as the UNM coeds back in Albuquerque loved that little sports car, and accordingly, so did I. The city of Telluride lies in a box canyon, and once you travel through the entrance, you find yourself staring up at the marbled peaks high above the valley. Snow had been sparse that winter, and the contrast between seasonal white and solid granite slate only served to emphasize the beauty of the place. Except…there was something missing. Gazing in wonder at the high mountains, I couldn’t help speculating what cinematographers call “the reverse,” in this case, looking down rather than up. Fast-forward roughly 50 years and two seasons. Now I know. I’m looking down on Telluride from 12,500 feet in a Mooney, the town now rediscovered almost accidentally by my Garmin GPS on a homebound flight from Wichita. As I make a giant circle around the geographical box, I’m amazed at the change in perspective. No one has moved the mountains, though most of the snow has retreated to the high peaks, and the town looks pretty much the same as it did back in 1966, a small, semi-remote hideaway that doubles or triples its population during tourist season. Telluride becomes more laid back in the summer “heat,” sometimes as torrid as 60 degrees F.
Today, I have the advantage of the real third dimension, not interpreting synthetic vision on a square screen, not translating elevation lines on a chart, but actually witnessing the thrust of the summits at their own level. It’s late afternoon in Colorado, and this is the true configuration of a Rocky Mountain high. I watch the shadows begin to slant across the valley, and the big pines reaching up for me, but falling far short. This is flying as it should be, unconstrained by the limitations of artificial altitude. Doesn’t matter how high you fly. The mere fact of traveling above rather than on the Earth is an end in itself. I rarely travel in non-pilot circles, but when I do, I prefer Dos Equis, and I’m most often asked questions about the difference between airline and general aviation transport. After a half-century of flying in “those little airplanes,” my answer has finally crystalized around the joy of do-it-yourself aviation and the remarkable difference in what you can see from medium-low altitude. 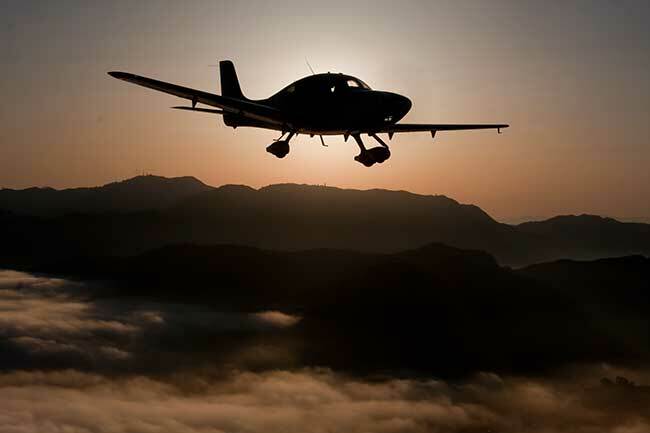 No matter how much faster airline travel may be, typically, 200 to 300 knots quicker than most private aircraft, airlines can never reproduce the same satisfaction considered normal in a Cub, Bonanza, Skyhawk or Aerostar. Probably everyone has had the passive thrill of walking down a narrow hallway, entering a large, rumbling room, taking a nap and waking up on the opposite coast or in another country. For those whose flight time has been confined to the often crazed, warped and dirty window of an airliner, forgive me, but airlines do everything possible to make flying semi-comfortable, but unexciting, sometimes convenient, but relatively boring, a group rather than an individual experience. In fact, the major carriers spend millions to provide passengers with entertainment, specifically because there’s often not much to see out the window other than slats, flaps, ailerons and spoilers. In contrast, a general aviation airplane is more like a flying version of my old Austin-Healey, good visibility straight ahead and behind, to both sides, nearly straight down and even straight up if you leave the top down, something you can never do in an Airbus or Boeing (Aloha Airlines 737 notwithstanding). Airline passengers are at a distinct disadvantage of enjoying the view for two major reasons. First, half the Earth’s atmosphere resides below 18,000 feet, and that bottom segment contains about 90 percent of the weather. That means airlines travel above the clouds most of the time. Second, the haze level has gradually risen so high over most of the inhabited world in the last 40 years that, even on a clear day, passengers can’t see much ground detail from FL300 and up. Following my first ferry trip in a new Piper Seneca II to the Paris Air Show in 1977, the return flight was an easy one-stop back to Los Angeles. About four hours out, the captain announced over the intercom that we were just coming up on the Greenland Icecap. Passengers who’d been dozing immediately perked up and raised their window shades. The weather over the North Atlantic was what passed for clear, but by that time, we were already at FL390. Of course, everyone was eager to get a glimpse of the magnificent fjords on Greenland’s east coast. No luck. That’s more the rule than the exception. I could see practically nothing but white in all directions except straight up. My preference for the middle road may not seem revolutionary, but it represents a paradigm shift in my attitude from the days when I was confined to Earth. Flying was hardly new to me when I made that college trip in 1966, but I didn’t own an airplane and had no money for a rental. My Christmas view of Telluride had been strictly two-dimensional. Logic dictated that I should have been more inured when I overflew Telluride that first time three years ago after a million or so miles had passed beneath my wings. Instead, I was captivated. We live life forward, but we remember it backwards, and the difference between my memories of that first trip to Telluride in a car and the Mooney hop was a revelation. Too often, it seems we take the vertical element for granted, when in fact, altitude is what allows us to rule the world. Wouldn’t it be great if you could live in a place such as Telluride? Wouldn’t it be terrible if you had to live there without access to an airplane? Thanks for the well written, humorous, entertaining article. All the best.